Early Christian views of God were expressed in the Pauline Epistles and the early creeds, which proclaimed one God and the divinity of Jesus, almost in the same breath as in 1 Corinthians (8:5-6): "For even if there are so-called gods, whether in heaven or on earth (as indeed there are many 'gods' and many 'lords'), yet for us there is but one God, the Father, from whom all things came and for whom we live; and there is but one Lord, Jesus Christ, through whom all things came and through whom we live." "Although the Judeo-Christian sect of the Ebionites protested against this apotheosis of Jesus, the great mass of Gentile Christians accepted it." This began to differentiate the Gentile Christian views of God from traditional Jewish teachings of the time. Although the New Testament does not have a formal doctrine of the Trinity as such, "it does repeatedly speak of the Father, the Son, and the Holy Spirit... in such a way as to compel a Trinitarian understanding of God." This never becomes a tritheism, i.e. this does not imply three Gods. Around the year 200, Tertullian formulated a version of the doctrine of the Trinity which clearly affirmed the divinity of Jesus and came close to the later definitive form produced by the Ecumenical Council of 381. The doctrine of the Trinity can be summed up as: "The One God exists in Three Persons and One Substance, as God the Father, God the Son and God the Holy Spirit." Trinitarians, who form the large majority of Christians, hold it as a core tenet of their faith. Nontrinitarian denominations define the Father, the Son, and the Holy Spirit in a number of different ways. 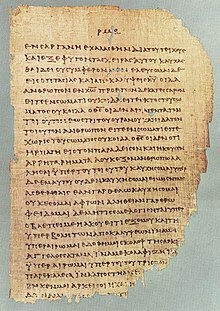 A folio from Papyrus 46 containing a copy of 2 Corinthians 11:33–12:9. This folio dates to between 175 and 225 AD. Apart from asserting that there is but one God, Paul's statement (which is likely based on pre-Pauline confessions) includes a number of other significant elements: he distinguishes Christian belief from the Jewish background of the time by referring to Jesus and the Father almost in the same breath, and by conferring on Jesus the title of divine honor "Lord", as well as calling him Christ. The period from the late 2nd century to the beginning of the 4th century (approximately 180-313) is generally called the "epoch of the Great Church" and also the Ante-Nicene Period and witnessed significant theological development, and the consolidation and formalization of a number of Christian teachings. From the 2nd century onward, western creeds started with an affirmation of belief in "God the Father (Almighty)" and the primary reference of this phrase was to "God in his capacity as Father and creator of the universe". This did not exclude either the fact the "eternal father of the universe was also the Father of Jesus the Christ" or that he had even "vouchsafed to adopt [the believer] as his son by grace". Eastern creeds (those we know come from a later date) began with an affirmation of faith in "one God" and almost always expanded this by adding "the Father Almighty, Maker of all things visible and invisible" or words to that effect. Throughout the Christian development of ideas about God, the Bible “has been, both in theory and in fact, the dominant influence” in the Western world. The Bible usually uses the name of God in the singular (e.g., Ex. 20:7 or Ps. 8:1), generally using the terms in a very general sense rather than referring to any special designation of God. However, general references to the name of God may branch to other special forms which express his multifaceted attributes. Scripture presents many references to the names for God, but the key names in the Old Testament are: God the High and Exalted One, El-Shaddai and Yahweh. In the New Testament Theos, Kyrios and Pater (πατήρ i.e., Father in Greek) are the essential names. However, later on the Hand of God symbol is found several times in the only ancient synagogue with a large surviving decorative scheme, the Dura Europos Synagogue of the mid-3rd century, and was probably adopted into Early Christian art from Jewish art. It was common in Late Antique art in both East and West, and remained the main way of symbolizing the actions or approval of God the Father in the West until about the end of the Romanesque period. 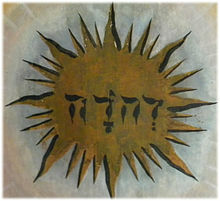 It also represents the bath Kol (literally "daughter of a voice") or voice of God, just like in Jewish Art. 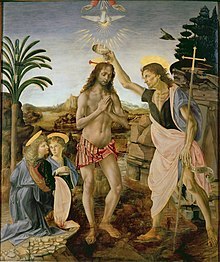 In situations, such as the Baptism of Christ, where a specific representation of God the Father was indicated, the Hand of God was used, with increasing freedom from the Carolingian period until the end of the Romanesque. This motif now, since the discovery of the 3rd century Dura Europos synagogue, seems to have been borrowed from Jewish art, and is found in Christian art almost from its beginnings. The use of religious images in general continued to increase up to the end of the 7th century, to the point that in 695, upon assuming the throne, Byzantine emperor Justinian II put an image of Christ on the obverse side of his gold coins, resulting in a rift which ended the use of Byzantine coin types in the Islamic world. However, the increase in religious imagery did not include depictions of God the Father. For instance, while the eighty second canon of the Council of Trullo in 692 did not specifically condemn images of The Father, it suggested that icons of Christ were preferred over Old Testament shadows and figures. The beginning of the 8th century witnessed the suppression and destruction of religious icons as the period of Byzantine iconoclasm (literally image-breaking) started. Emperor Leo III (717–741), suppressed the use of icons by imperial edict of the Byzantine Empire, presumably due to a military loss which he attributed to the undue veneration of icons. The edict (which was issued without consulting the Church) forbade the veneration of religious images but did not apply to other forms of art, including the image of the emperor, or religious symbols such as the cross. Theological arguments against icons then began to appear with iconoclasts arguing that icons could not represent both the divine and the human natures of Jesus at the same time. In this atmosphere, no public depictions of God the Father were even attempted and such depictions only began to appear two centuries later. The Second Council of Nicaea in 787 effectively ended the first period of Byzantine iconoclasm and restored the honouring of icons and holy images in general. However, this did not immediately translate into large scale depictions of God the Father. Even supporters of the use of icons in the 8th century, such as Saint John of Damascus, drew a distinction between images of God the Father and those of Christ. 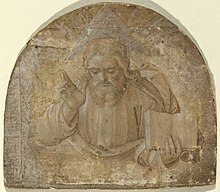 But images of God the Father were not directly addressed in Constantinople in 869. A list of permitted icons was enumerated at this Council, but symbols of God the Father were not among them. However, the general acceptance of icons and holy images began to create an atmosphere in which God the Father could be symbolized. 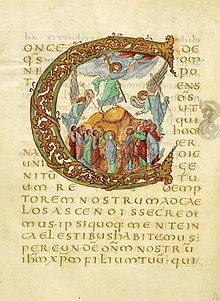 By the 12th century depictions of God the Father had started to appear in French illuminated manuscripts, which as a less public form could often be more adventurous in their iconography, and in stained glass church windows in England. Initially the head or bust was usually shown in some form of frame of clouds in the top of the picture space, where the Hand of God had formerly appeared; the Baptism of Christ on the famous baptismal font in Liège of Rainer of Huy is an example from 1118 (a Hand of God is used in another scene). Gradually the amount of the human symbol shown can increase to a half-length figure, then a full-length, usually enthroned, as in Giotto's fresco of c. 1305 in Padua. In the 14th century the Naples Bible carried a depiction of God the Father in the Burning bush. By the early 15th century, the Très Riches Heures du Duc de Berry has a considerable number of symbols, including an elderly but tall and elegant full-length figure walking in the Garden of Eden, which show a considerable diversity of apparent ages and dress. The "Gates of Paradise" of the Florence Baptistry by Lorenzo Ghiberti, begun in 1425 use a similar tall full-length symbol for the Father. The Rohan Book of Hours of about 1430 also included depictions of God the Father in half-length human form, which were now becoming standard, and the Hand of God becoming rarer. At the same period other works, like the large Genesis altarpiece by the Hamburg painter Meister Bertram, continued to use the old depiction of Christ as Logos in Genesis scenes. 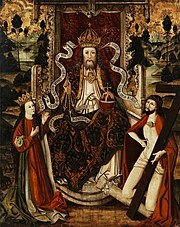 In the 15th century there was a brief fashion for depicting all three persons of the Trinity as similar or identical figures with the usual appearance of Christ. God the Father is symbolized in several Genesis scenes in Michelangelo's Sistine Chapel ceiling, most famously The Creation of Adam (whose image of near touching hands of God and Adam is iconic of humanity, being a reminder that Man is created in the Image and Likeness of God (Gen 1:26)).God the Father is depicted as a powerful figure, floating in the clouds in Titian's Assumption of the Virgin in the Frari of Venice, long admired as a masterpiece of High Renaissance art. The Church of the Gesù in Rome includes a number of 16th century depictions of God the Father. In some of these paintings the Trinity is still alluded to in terms of three angels, but Giovanni Battista Fiammeri also depicted God the Father as a man riding on a cloud, above the scenes. In both the Last Judgment and the Coronation of the Virgin paintings by Rubens he depicted God the Father using the image that by then had become widely accepted, a bearded patriarchal figure above the fray. In the 17th century, the two Spanish artists Velázquez (whose father-in-law Francisco Pacheco was in charge of the approval of new images for the Inquisition) and Murillo both depicted God the Father using a patriarchal figure with a white beard in a purple robe. Interpretations of the term Kingdom of God have given rise to wide-ranging eschatological debates among scholars with diverging views, yet no consensus has emerged among scholars. From Augustine to the Protestant Reformation the arrival of the Kingdom had been identified with the formation of the Christian Church, but this view was later abandoned and by the beginning of the 20th century the apocalyptic interpretation of the Kingdom had gained ground. In this view (also called the "consistent eschatology") the Kingdom of God did not start in the 1st century, but is a future apocalyptic event that is yet to take place. A number of gospel passages warn against sin and suggest a path of righteousness to avoid the judgement of God. For instance, the Sermon on the Mount in Matthew 5:22-26 teaches the avoidance of sin and the Parables of the Kingdom (Matthew 13:49) state that at the moment of judgement the angels will "sever the wicked from among the righteous and shall cast them into the furnace of fire". Christians can thus enjoy forgiveness that lifts them from the judgement of God by following the teachings of Jesus and through a personal fellowship with him. Bernhard Lohse (1928-1997) states that the doctrine of the Trinity does not go back to non-Christian sources such as Plato or Hinduism and that all attempts at suggesting such connections have floundered. The majority of Christians are now Trinitarian and regard belief in the Trinity as a test of true orthodoxy of belief. In Trinitarian theology, God the Father is the "arche" or "principium" (beginning), the "source" or "origin" of both the Son and the Holy Spirit, and is considered the eternal source of the Godhead. The Father is the one who eternally begets the Son, and the Father eternally breathes the Holy Spirit. The Son is eternally born from God the Father, and the Spirit eternally proceeds from the Father, and, in the Western tradition, also from the Son. Trinitarians believe that God the Father is not pantheistic, in that he is not viewed as identical to the universe, but exists outside of creation, as its Creator. He is viewed as a loving and caring God, a Heavenly Father who is active both in the world and in people's lives. He created all things visible and invisible in love and wisdom, and man for his own sake. Since early Christianity, a number of titles have been attributed to Jesus, including, Messiah (Christ) and the Son of God. Theologically, these are different attributions: Messiah refers to his fulfilling the expected Old Testament prophecies, while Son of God refers to a paternal relationship. God the Son is distinct from both Messiah and Son of God and its theology as part of the doctrine of the Trinity was formalized well over a century after those. 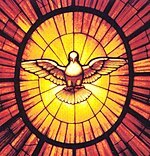 Church stained glass representation of the Holy Spirit as a dove, Bernini c. 1660. The Holy Spirit enables Christian life by dwelling in the individual believers and enables them to live a righteous and faithful life. He acts as Comforter or Paraclete, one who intercedes, or supports or acts as an advocate, particularly in times of trial. He acts to convince unredeemed persons both of the sinfulness of their actions and thoughts, and of their moral standing as sinners before God. The Holy Spirit both inspired the writing of the scriptures and now interprets them to the Christian and church. In Eastern Orthodox theology, essence of God being that which is beyond human comprehension and can not be defined or approached by human understanding. Roman Catholic teachings are somewhat similar in considering the mysteries of the Trinity as being beyond human reason. However, differences exist in that in Roman Catholic theology and teaching, God the Father is the eternal source of the Son (begot the Son by an eternal generation) and of the Holy Spirit (by an eternal procession from the Father and the Son) and the one who breathes the Holy Spirit with and through the Son, but the Eastern Orthodox consider the Spirit to proceed from the Father alone. Most Protestant denominations and other traditions arising since the Protestant Reformation, hold general Trinitarian beliefs and theology regarding God the Father similar to that of Roman Catholicism. This includes churches arising from Anglicanism, Baptist, Methodism, Lutheranism and Presbyterianism. Likewise, The Oxford Dictionary of the Christian Church describes the Trinity as "the central dogma of Christian theology". However, a precise representative view of Protestant Trinitarian theology regarding "God the Father", etc., is more difficult to provide, given the diverse and less centralized nature of the various Protestant churches. Nontrinitarianism goes back to the early centuries of Christian history and groups such as the Arians, Ebionites, Gnostics, and others. These nontrinatarian views were rejected by many bishops such as Irenaeus and subsequently by the Ecumenical Councils. The Nicene Creed raised the issue of the relationship between Jesus' divine and human natures. After it was rejected by the Council of Nicea, nontrinitarianism was rare among Christians for many centuries, and those rejecting the doctrine of the Trinity faced hostility from other Christians, but the 19th century saw the establishment of a number of groups in North America and elsewhere. 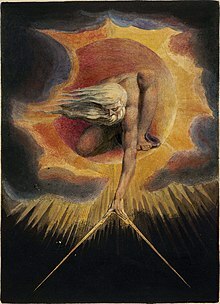 In the theology of God in Mormonism, the most prominent conception of God is the Godhead, a divine council of three distinct beings: Elohim (the Father), Jehovah (the Son, or Jesus), and the Holy Spirit. The Father and Son are considered to have perfected, material bodies, while the Holy Spirit has a body of spirit. Mormonism recognizes the divinity of the Father, Son, and Holy Spirit, but believes they are distinct beings, united not in substance but in will and purpose, and they are each omniscient, omnipotent, and omni-benevolent. ^ Peter Stockmeier in the Encyclopedia of Theology: A Concise Sacramentum Mundi edited by Karl Rahner ISBN 0860120066 (New York: Sea-bury Press, 1975) page 375-376 "In the following period, c. 180-313, these structures already determine essentially the image of the Church which claims a universal mission in the Roman Empire. It has rightly been termed the period of the Great Church, in view of its numerical growth, its constitutional development and its intense theological activity." ^ David Ray Griffin, God, Power, and Evil: a Process Theodicy (Westminster, 1976/2004), 31. ^ "Council of Moscow - 1666-1667". Retrieved 30 December 2016. ^ a b c Kärkkäinen 2002, p. 120-121. ^ T C Hammond (1968). Wright, David F (ed.). In Understanding be Men: A Handbook of Christian Doctrine (sixth ed.). Inter-Varsity Press. p. 134. ^ Dahl, Paul E. (1992). "Godhead". In Ludlow, Daniel H (ed.). Encyclopedia of Mormonism. New York: Macmillan Publishing. pp. 552–53. ISBN 0-02-879602-0. OCLC 24502140. .